So now it's up to you to decide what caption fits best. Add one in the comments below and if our crack team of humor experts deems yours most worthy, we'll send you this incredibly green pi-top. Captions submitted any other way besides in the comment section will not be accepted! That means do not use the feedback form, though you may really, really want to. Winner will be announced next Monday, 9/26. We'll see you then! I think we're gonna need a bigger 'bot. What? You were expecting Barbie & Ken. Buuurrpp! Haven't seen 'em. What happens when you cross a land shark with AVC: Sharkfun! Bruce completed the cross country drive in his tiny Jeep, but at long last, he may have finally found a place where he could get fitted with a frickin' laser beam. With the addition of left turns to the new course, Left Shark now has a fin up on the competition!! crazy how nature make dat. I have no idea what I am doing here. 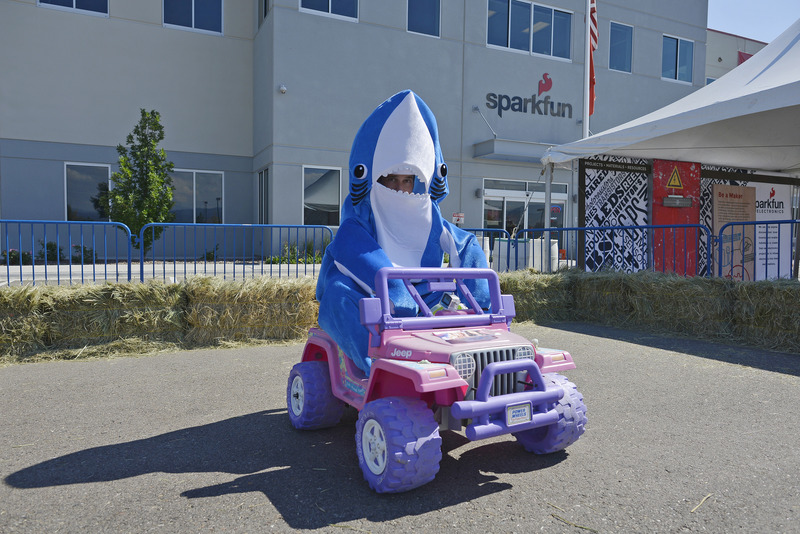 I said, "SparkFun" - not "SharkFun!" I am tired of these $%&@ sharks on this &*$@% PRS! After the end of his short-lived cartoon career in the 1970s, Jabberjaw was reduced making celebrity appearances and selling autographs at monster truck rallies around the country. Left shark lost the race after turning left into the pits on the first turn. After a successful career scaring land-dwellers, Jaws retired in a quaint little town in Colorado and took on a new hobby in AVC competitions. In urgent need for directions. I am late for my shark tank pitch. Maker Faire? I thought this was a Mako Fair! I'm a Barbie shark, in my Barbie ark Imagination, life is your creation...where's all my 90's sharks at?! Welcome to SparkFun, can I take your order? I'll have the Mahi Mahi Deluxe, some of your Raspberry Pi, and large Coke. just when you thought it was safe to go back in the slow lane. Left Shark goes platinum with his hit "I'm in a Jeep (featuring Sea-Swain)", the official theme for SyFy's latest epic "Shark-race-o: The Noise is Fast and Spurious"
Before being completely swallowed, the marine biologist got a fascinating glimpse into the commuting habits of the great white shark. Introducing the latest Rescue Bot for beached sharks designed by Sparkfun - "Shore-Shark Redemption"
Know what this is missing? Laserbeams on its freaking head. Wait, I think I brought one of those. A Very Courteous left shark. Straight from AVC to The Halftime Show. This is: THE $6 MAN! As a safety feature this rugged PRS vehicle comes Jaws-of-life built in. How did I go from snuggling with Katy Perry at the Super Bowl to driving this Uber clown car? Flowers. Plumber, ma'am. Candygram. Wait. I-I'm only a dolphin, ma'am. Lori Greiner, From Shark Tank, stopped by SparkFun today to talk to Nick about selling the Makey Makey Delux kit on QVC and Bed Bath and Beyond. I said you could sit with me as long as you didn't eat me! Now hitch a ride back to the ocean on that tornado. Where did you get that car? And where's barbie? P.S. I went to AVC this tear, and it was soooooooo fun. Thanks for hosting such a great event. Land Shark! Hey - Where's Barbie? "Uh have you guys seen the Flash around? Just askin' no problem." I was wondering where my lawyer went. Sorry I'm late for rehearsal Katy, I knew I shoulda taken that left turn at Albuquerque! Looks like he's ready for the Jaws 19 audition down side I think he's a little late. Carcharodon Sparkfunicus - A rare annual visitor to Boulder; known for autonomous hunting, it never tries too hard to catch it's prey. Beware versions with attached LASERS. 4-Wheel-Drive Shark On A Stick! Unfortunately, not everyone is cut out to be a Mario Kart racer. First documented shark attack in Colorado! Left Shark for the Win!! He simply devoured the competition. Driven by his brother's success in Nascar, RIght Shark decides to try his hand in the Power Racing Series. Frank was having a hard time transitioning to a land shark. I will fly my Jeep to the stars. Come on out, kids. It's lunchtime! Nate meets Genie: wish #1 fulfilled. Some say Power Wheels Racing has jumped the shark, I say give me a ramp and I'll jump you. In silent protest, "Left Shark" refused to race on a track with all right hand turns!!! Your November Caption Contest is Here!